A garden arbor adds style and elegance to any garden. There are few things more elegant than a white arbor covered with climbing roses. Whether you use it to frame an entrance or use one as a background or focal point, you will be glad you added one of these gardening accessories to your garden design. As seen to the right, they also make great photo backdrops for those important junior prom pictures. Blending one in with a fence can create a grand entrance that ties the whole garden design together. These structures can be made from virtually any material. Traditionally, wood and wrought iron have been used but many of the newer materials such as vinyl and polyester resin offer reduced maintenance. They can also be made from easily available materials such as copper, iron or PVC pipe and fittings. Utilizing these materials, one can build a nice one, even with minimal tools and at any skill level. Copper pipe will develop a green patina with age that will blend into your landscape. 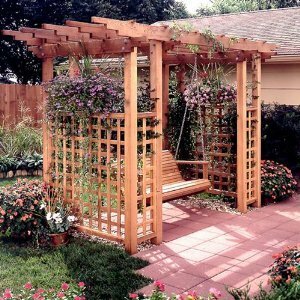 Here is a link to Downloadable Woodworking Plans for this beautiful Garden Arbor Getaway . This design is actually more of a pergola with trellis sides. The swing makes a nice spot to sit in the evening and admire your garden. In addition to climbing roses, wisteria or grape vines are a perfect choice to trail up the sides and over the top.